Elijah Zimmerman of Archbold works the ball up the left sideline Saturday versus Independence in a Division III boys soccer regional final. The Bluestreaks shut out the Blue Devils 3-0, punching them a ticket to state. 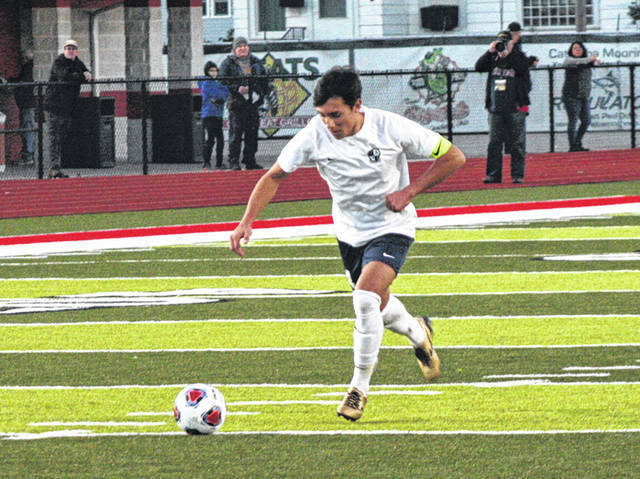 Josh Kidder of Archbold starts the process of a free kick during Saturday’s regional final. After a series of passes, he eventually got it to Trey Theobald who was able strike gold for Archbold’s first goal. Archbold’s Andrew Hogrefe boots a corner kick. 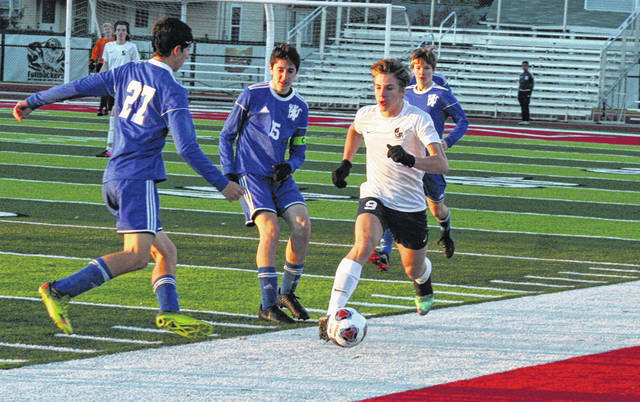 PORT CLINTON – Like a carbon copy of the 2015 season, Archbold boys soccer punched its ticket to state with a 3-0 win over Independence in a Division III regional final in Port Clinton Saturday evening. Also at Port Clinton three years ago, the Bluestreaks defeated Columbia Station Columbia 3-1. Seeing time as a freshman on that team, senior Josh Kidder now gets to bookend his career with trips to state. The Streaks cashed in just under 17 minutes in on a nice two-man game from Kidder and Trey Theobald. On a direct free kick from Kidder, he elected to pass to Theobald who got it right back to Kidder running towards the net, then he found Theobald again who scored for a 1-0 lead. Archbold continued to pressure the net throughout the half. On a Javier Peche corner kick with 1:41 remaining, Elijah Zimmerman and Kidder each had quality looks but both shots were turned away by Independence keeper Ethan Manelski. However, Zimmerman would not be denied in the early minutes of half number two. He headed one in to give the Streaks a two-goal advantage with 37:15 to go. They cruised from that point on. Andrew Hogrefe then converted a putback after a hard shot from Theobald to complete the scoring with 11:57 remaining. It was the first loss of the season for Independence. The Bluestreak boys are the fourth Archbold team to make it to state this season, joining the boys golf team, girls cross country and girls soccer. It will now be a doubleheader of state semifinal action Tuesday at Cedar Point Stadium on the campus of Sandusky High School. First, the Archbold girls will battle Kirtland at 6 p.m. The Archbold boys (18-1-0) will follow – also against Kirtland (15-1-3) – at approximately 8 p.m. The first goal Archbold scored Wednesday might have been with a little luck. The other three, those were all skill. 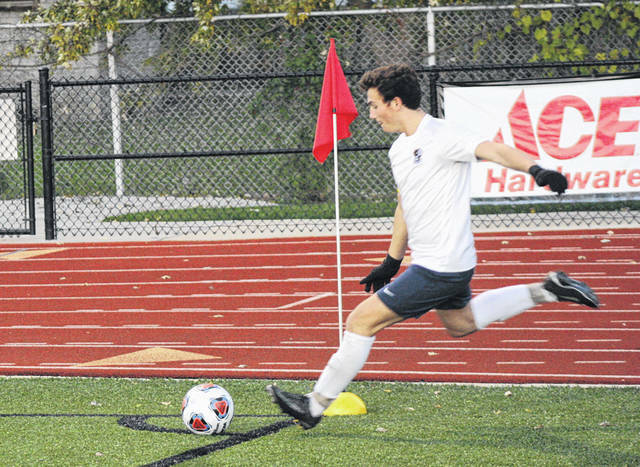 Using that first goal seven minutes into the contest, the Streaks ran past Kalida 4-0 in a Division III boys soccer regional semifinal at Graham Stadium in Findlay. Kalida helped with the first goal. The help came in the form of a defender, who was trying to run with Archbold’s Trey Theobald towards the net. When the ball cut behind the two players, the heel of the Kalida defender struck the ball and it careened into the net for an Archbold goal. The Streak offense was on display for the rest of the half. With just under 27 minutes to go in the first half, Clay Gerig fed Elijah Zimmerman for a goal and a 2-0 lead. Gerig added a second assist in the half when he sent a ball outside the box to a waiting Josh Kidder, who blasted in his 91st career goal. “For us, it really was about effort,” mentioned Stewart. “We didn’t pass the ball real crisp. We were lacking and had a letdown there, but I couldn’t fault the effort. Archbold tacked on a goal in the second half when Andrew Hogrefe found Gerig. Kalida took three shots on goal in each half. The three in the second half were good shots, but each time Noah Cheney was able to step up and make a save.